What a Relief: Is Bullpen the Answer to Yanks’ Questionable Rotation? The Yankees haven’t yet been able to bolster their starting staff with a key addition, which has been the cause of great concern in Yankees Universe. All winter long, fans and team executives have repeatedly stated that the off season resolves around pitching, pitching, pitching, but maybe they’ve all been looking at the wrong end of the staff? Instead of seeking out other teams for reinforcements, perhaps the team, and its fans, should start looking inward? If relief is on the way, it could be coming from the bullpen. In 2011, Yankees’ relievers posted an ERA of 3.12, which was the team’s sixth lowest rate since 1974. The bullpen’s fWAR of 7 was also the Yankees’ sixth highest total over the same span, which helps explain why the Bronx Bombers were able to win 97 games with a starting staff that stumbled down the stretch and finished the season with an ERA above 4.00. After the Fall: How Do Young Closers Respond to Blown Saves in October? The Texas Rangers made a surprise move by agreeing to terms with Joe Nathan on a two-year deal worth $15 million in guaranteed money. After making the announcement, the team decided to kill two birds with one stone by also letting it be known that former closer Neftali Feliz will be joining the rotation in 2012. The pair of moves seems to make sense, especially because free agent C.J. Wilson appears to be on his way out of town. Considering the lack of comparable starters available (and affordable), and the glut of relievers on the market, moving the 24-year old Feliz’ electric arm into the rotation should give the Rangers the best chance to remain competitive in the A.L. West. 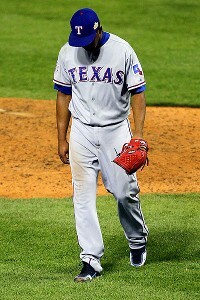 But, is that the only reason the Rangers are moving Feliz to the rotation? According to Buster Olney, the lingering effects of Feliz’ blown save in the sixth game of the World Series might also be a factor. In a series of Tweets, Olney expressed sentiments that are probably widely believed throughout the game: young closers who blow big games become damaged goods. So, if the Rangers had any concerns about Feliz’ ability to stare down the barrel of the ninth inning going forward, it would make sense to usher him into the rotation. Before the Yankees’ adopted a six-man rotation at the end of July, the team’s starters had posted one of the lowest combined ERAs in the league. Since then, however, the Yankees’ rotation has ranked 9th in the league with a 4.85 ERA. Coincidence or correlation? When Joe Girardi first decided to expand the rotation to six, it was presented as a temporary solution to the Yankees’ glut of starters. In reality, however, it was really a structure designed to keep the struggling A.J. Burnett in a starting role. Six weeks later, not only has Burnett continued to weigh on the team, but now it seems as if the efforts made to accommodate the erratic righty have brought the rest of the staff down with him. Note: Yankees began using six-man on July 30; August 1 used for comparison to league because of ease of calculation. 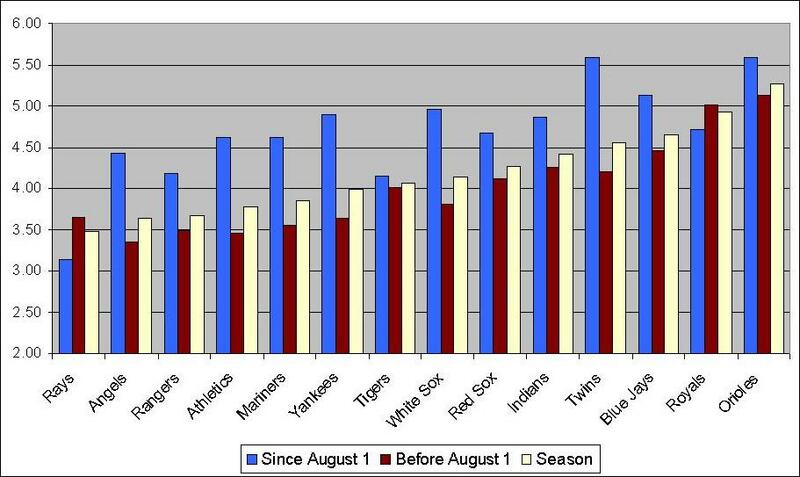 Luckily, the Yankees’ offense produced at season-high levels during August and early September. As a result, the team’s winning percentage has actually been higher since the Yankees’ adopted the six-man rotation (.614 vs. .600). However, the end doesn’t justify the means. Not only could the Yankees have won even more games during this period, but the team now finds itself with a rotation in flux only two weeks before the start of the post season. The six-man rotation may have been designed to accomplish something, but it’s hard to figure out exactly what. Earlier today, I addressed a provocative look at WAR from a philosophical point of view. However, there was one statistical element nestled within the IIATMS post that seems worthy of a closer examination. If there really “significant evidence” to support such a conclusion? Based on current data, there are actually 15 teams that have had a FB% above 40% and 23 teams with a FB% below 33%, but otherwise the general findings from the post are accurate (four high FB teams had a negative UZR, while five low FB teams had a positive UZR). So, it does seem as if there is a link between the two elements. 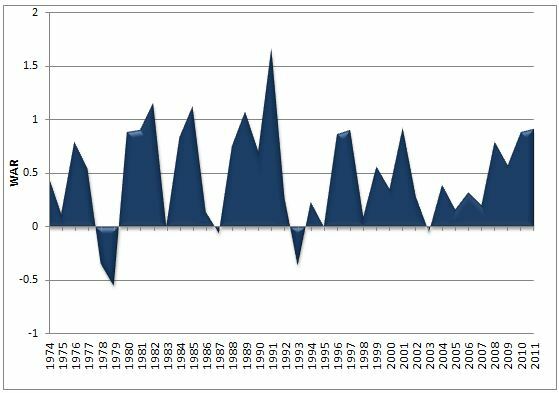 However, when you consider that a relatively few teams have exhibited extreme fly ball tendencies (38), and of that group almost half (18) were from 2003-2005 (a period when batted ball data collection was less refined as it is now), it’s hard to draw any meaningful conclusion from such an arbitrary analysis. Furthermore, if one compares the fly ball rate of every team since 2003 to its outfield UZR, the correlation is a very low .14. What’s more, within each “extreme” end of the entire sample, there also isn’t a compelling correlation (.18 at the high end and -.30 at the low end). So, that leaves us wondering why being at the extreme end of the defined fly ball parameters would influence the positive or negative value of outfield UZR. Finally, it’s worth noting that If UZR/150 is used instead of UZR, the mean rates at each extreme parameter are +4.4 on the high end and -3.5 on the low end, and the overall correlation is a similar .15. One reason why there may not be much of a correlation between the two figures is because FB% is based only on balls put in play. By ignoring, among other things, strikeout rate, and therefore total chances, using batted ball percentages can be misleading. The 2010 Giants are a perfect example of this dynamic. Last year, San Francisco pitchers allowed the second highest fly ball rate at 40.7%, but also struck out a league leading 1,331 batters. As a result, the team’s outfielders only encountered 884 balls into the “outfield zone”, which ranked 19th in the major leagues. Somewhere in the data may be a meaningful link between fly ball rates and outfield UZR, but on the surface, it seems mostly anecdotal. For a link to the data used in this quick analysis click here, and feel free to pass along any more meaningful findings derived from its use. Win-Win Situation: Do Pitchers Really Pitch to the Score? When Felix Hernandez won the 2010 AL Cy Young with a 13-12 record, it was a watershed event in terms of how award voters weigh various statistics. In the past, Hernandez’ low win total would have all but eliminated him from consideration, but more recently, a growing percentage of the electorate has started to use more advanced measures of performance, or, at the very least, more traditional measures, such as ERA, that aren’t as team-dependent as wins. Justin Verlander's fastball is one of the most potent weapons in the game. Just because Hernandez won last year’s Cy Young, however, doesn’t mean the debate about the true value of wins is over. Many in and around the game still advance the theory that because pitchers factor the score into their pitch selection, more advanced measures of performance, often called peripherals, can become distorted. In a lively Twitter debate, Buster Olney provided a quintessential example of this phenomenon by asking: with two outs and a man on third in the fourth inning, what kind of pitch would Justin Verlander throw in a 3-2 count if his team was winning by four runs? According to Olney, Verlander would be more apt to throw a fastball in that situation because he would care less about “giving in” than avoiding a walk (i.e., risking a bigger inning by putting another man on base). The clear implication is that Verlander’s ERA would then be distorted because his primary goal wasn’t to prevent a run, but avoid surrendering the lead (i.e., getting the win). Before testing this theory, it’s worth considering that if the Verlander “pitches to the score” than it’s likely others do as well (meaning relative ERA would still be a sound basis for comparison). What’s more, it would also stand to reason that batters “hit to the score” (and maybe defensive players field to the score?). For example, using Olney’s scenario, we might posit that a hitter sitting dead red on 3-2 would try to turn on the pitch instead of take his normal swing. Although taking this approach could theoretically increase the chances of making an out (because the hitter isn’t reacting, but pre-determining his approach), it would also enhance the likelihood of a home run, which would do more to cut into a big deficit. In other words, pitching to the score and hitting to the score could very well cancel out. 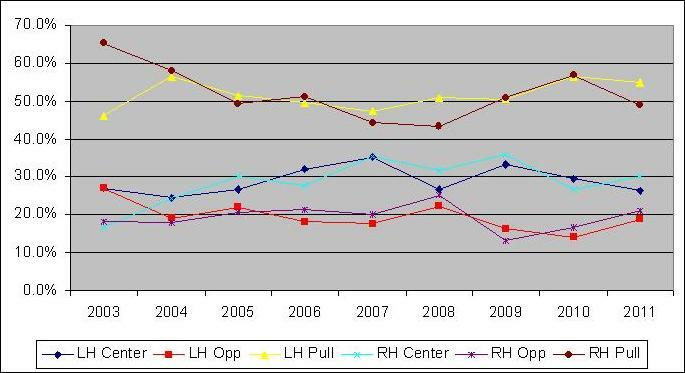 Note: FB= fastball; SL= slider; CU = curve; CH = change. 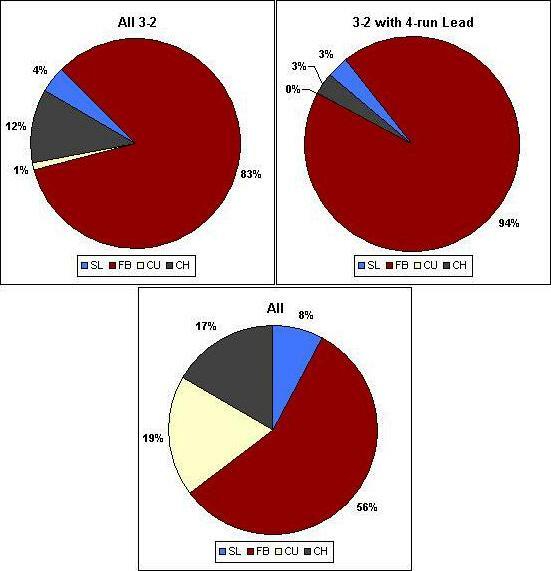 3-2 samples are 191 for “all” and 30 for “with 4-run lead”. 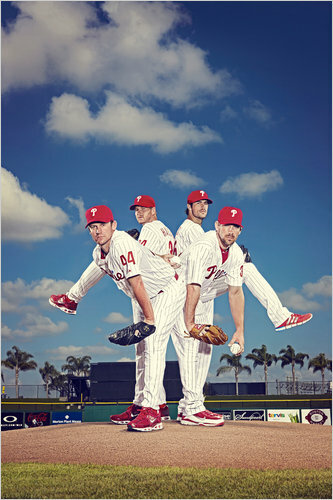 The Phillies pitching rotation has had a monster season in 2011 (Photo: NY Times). In the offseason, the Philadelphia Phillies “Four Aces” rotation was heralded as having the potential to be one of the best ever. Considering the track records of Roy Halladay, Cliff Lee, Cole Hamels, and Roy Oswalt, those lofty pre-season expectations were far from hyperbole. Perhaps that’s why much less attention has been paid to the fact that the Phillies have actually made good on even some of the most optimistic predictions. To date, the Phillies’ team ERA of 3.05 ERA is the franchise’s lowest total since the dead ball era (2.46 ERA in 1917). Compared to the rest of the league, the current ERA+ of 128 also ranks as the NL’s best rate since the 2003 Dodgers ended the year at that same level. Put into further context, the Phillies have allowed 22.1% fewer runs than the league average, a comparative advantage surpassed by only 20 other teams since 1901. Clearly, the Phillies’ pitching has lived up to its billing. 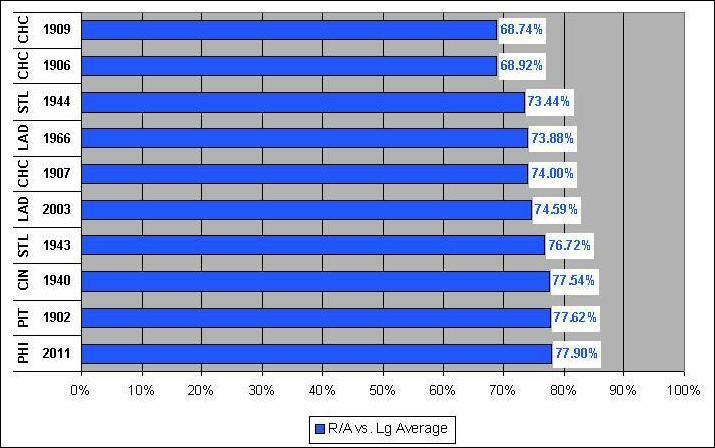 *Based on percentage of runs allowed per game below league average. Back in May, I examined some trends that suggested Mark Teixeira was evolving into a much more one-dimensional hitter. Despite beginning the season with what was for him an especially hot start, the switch hitting slugger’s splits still seemed to suggest the continuation of a pull-conscious batting approach that started in 2010. At the time, only 41 games had been played, so the sample size was limited, but now that three-quarters of the season has passed, we can take a more definitive look. Note: Off field = Opposite + Center. The chart above looks almost exactly like the one from May 18. It shows a slight moderation in the number of balls pulled by Teixeira, but continues the more prevalent rise since 2007. The chart also continues to display the gradual decline in balls hit to the “off field”, although an inverse relationship between balls hit to center and the opposite field seems to exist. In addition, a moderate correlation between OPS+ and percentage of balls hit to the off field is also evident in the data. Since the first analysis was run on May 18, Teixeira has been using the entire field a little bit more, especially as a left handed batter. Whereas the switch hitter had been pulling the ball in 57% of his at bats from the port side, his current rate stands at 55%. A more moderate decline has also been experienced from the right side (50% to 49%). 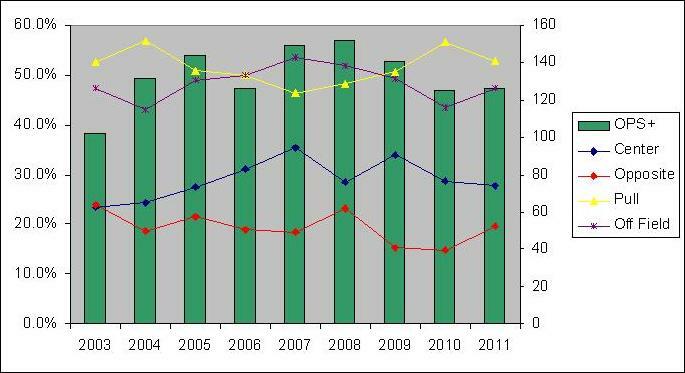 However, there is a divergence in where those balls are being hit instead. As a lefty, Teixeira is now hitting the ball to left field in almost 19% of his at bats, an almost 2% rise since earlier in the season, giving him one of his highest opposite field percentages as a left hander over the last five years. Meanwhile, from the right side, the first baseman is using center field more, and mostly at the expense of the opposite field. On May 18, Teixeira’s split was 25%/25% to each sector, but now it stands at 30%/21% in favor of up the middle.